At Mike Garage Door Specialist in San Diego we offer the premier Garage Door Remote service in San Diego County hands down. We can be bold enough to make this statement because we know that we carry the best garage door remotes in the industry; using only brand names that have earned the respect and trust of garage door owners for years. In addition, we know that our garage door company in San Diego has assembled the most experienced, professional, and friendly staff on the entire west coast. We set out to be the best garage door contractor in town. Our goal was to offer a variety of garage door services that exceeded expectations. We have done that with our San Diego Garage Door Remote service and much more. We offer a great variety of Garage Door Remotes at Mike Garage Door Specialist in San Diego. Even though it may not require a rocket scientist to install, replace or repair a garage door remote system; we sincerely suggest that you leave this work to a professional like those found at our San Diego Garage Door Company. Our technicians have the training to provide the specified garage door service quickly and effectively. We are not telling the DIY faithful they can’t do it; we are just saying we will provide a great garage door remote service the same day you order it and you do something more satisfying with your time. 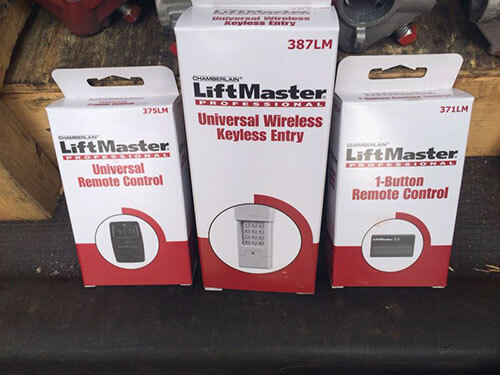 Liftmaster Security +: This system uses rolling code technology. Simply put, when the user pushes the open button a new code rolls over each time so that no one will be able to copy your code with hopes of opening your garage door at a later time. Compatible with numerous brands of garage door openers. Genie Intellicode: The Genie Intellicode system also utilized rolling code technology. Compatible with many garage door opener brands. Clicker: This system is popular because it is the closest thing to a universal remote there is in the industry. This remote is compatible with around 90% of all openers. Multi Code: Multi Code is a nice remote that allows you to connect to two frequencies at one time. However, this remote only works with Multi Code frequencies. You won’t find better garage door remotes for the price anywhere. The best thing is at Mike Garage Door Specialist in San Diego we carry all of these great garage door remotes everyday just for our customers. Here are a few tips about garage door remotes. If your remote does not seem to be working check the battery first. If the battery seems to be okay; then check to ensure there is nothing between your remote and receiver that would interfere with the signal. Our technicians at our garage door service in San Diego would be more than happy to check out your garage door remote for you.